Barbershops are still one of the most hyper-masculine places in America, and as much as professional barbers do not want to admit it is still a place where groups of men sit around and have closed minded, one sided conversations about homosexuality. Now that is the very short answer to the question that @Justinj1232 posed yesterday via twitter. The long answer is something that I think most gay men do not want to admit, disclose, or and issues that they even want to tackle. I believe the underline reason that gay men don’t like barbershops is because Barbershops tend to house the type of men gay men are attracted too, seek, and ultimately go after. I have always been somewhat afraid of getting my haircut, but not the actual clippers but the experience and ritual that came with going to get it done. Even as a young gay kid with my mother, father, or uncle sitting in the waiting area I always felt like at any given moment an alarm would sound and the guy cutting my hair would somehow discover that I was low key enjoying his bulge rubbing up against my hand whenever he turned the chair. It was this fear of somehow being “found out”, that fuelled my fear to going to one of the most beloved staples in the black community. The fear that I would be subsequently harassed or chastised for feelings and hormones I had no control over, and did not really understand, by men I found to be the definition of attractive at that young age. It was like in my mind and with my vivid imagination I always felt like when a group of five or more uber-masculine men got together their masculine energy came together to form into some type of “Supermale”, who’s only power is to sniff out and destroy less macho or gay men….Like a damn gay bashing Captain Planet. In the gay community, we tend to idolize and put on a pedestal the ideals that to be attractive as a man you must be masculine, fit, and passable to our hetero brothering. Now we can argue that this is basic “trickle down genetics” yielded to us by our forefathers, and gay caveman ancestors who only sought the stronger and more dominate as our leaders and/or lovers. On the other hand, you can argue that it is just simply the media and how to be masculine in America is the cultural norm and has been for a while. All in all no one really wants to be known as the bottom but everyone wants to take that…..eggplant. And with the barbershop being a place where masculinity is cultivated, expressed, and glorified it only makes sense that it’s a place where the gay man not only loves to frequent but also fears. 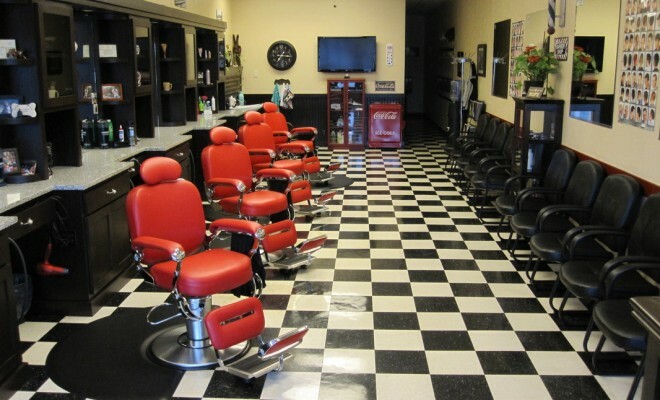 One could also argue that the barbershop will be the last great battle when it comes to the gay man being respected and accepted within the male community, ESPECIALLY in the black community where the barbershop is held as a staple and symbol of black entrepreneurship, community, and vocal candidness. However, this respect must first come from the respect we give to ourselves. What do you think we can do to fight this homophobia in the black community? Next Story → A Gay American Horror Story?? Get Ready to Be Slayed!